Chioggia Beet Borscht… I actually liked it! Who knew? Going into it, I honestly had no idea how I would feel about borscht. Pureed beets and broth? Meh. However, since I had chioggia beets on hand from last week’s CSA share, I figured there was no better time like the present to give borscht a try. I won’t hold you in too much suspense – I actually really liked it! (As though you couldn’t figure it out already, given the title of this post). I first heard about borscht when I was in college. My roommate, Lilly, was studying International Business with a focus on Russia, and as her study abroad time was approaching, she kept making cracks about how she’d have to eat borscht everyday (I had no idea what it was, but I could tell that she didn’t seem pleased about it). After she referred to it several times, I finally asked her what she was talking about, and she explained that it’s pureed beet soup – a specialty in Russia that she was certain she would have to eat all the time… (and from what I understand, she did end up eating a lot of borscht….). Of course, as I’ve “matured” (ha!) and gained experience in a variety of international foods, I’ve come to realize that borscht is more broadly found in eastern and central Europe (not just Russia), and each country has it’s own unique recipe. Many traditional borscht recipes actually seem to include meat, but mine doesn’t. I’m not sure which country’s version mine is most like, but I tried to keep it simple and took inspiration from several recipes I found in my cookbooks. Since this is actually the first time I’ve tried borscht, I’m not even sure if it tastes the way that it should. It definitely wasn’t the deep red color I was expecting it to be, but that made sense as soon as I peeled my beets and saw that they were actually white and orange striped (I wish I’d taken a photo of them – just look up “Chioggia Beets” on Google and you’ll see what I mean). All I know is that I thought it tasted pretty good. I’m not a big soup person (especially when it’s pureed vegetables), but I had two bowls! I should tell you, though, that Kirk won’t try it – he hates beets and won’t even entertain the idea of sampling it. That’s why I was sneaky and made it on a night when he was out at band practice (although he could smell it when he got home). Anyway, that’s just my warning to say that I don’t have a second opinion on this one, so I guess you’ll just have to trust me when I tell you that I thought it turned out pretty good, but sometimes I like things that are kind of weird 🙂 Take all of this with a grain of salt (ha! grain of salt – what a nice play on words! I crack myself up sometimes). I think the secret to the success of this recipe is that I kept it simple – that seemed to work well for me. Simplicity paid off! Preheat oven to 400F. Line a baking sheet with aluminum foil. Place the beets (they should still have about a 1 inch stem, and DON’T PEEL THEM YET! The skin helps retain color and keep them moist) in a large bowl and add 1 tablespoon of the olive oil then sprinkle salt and pepper. Make sure the beets are well coated in oil. Empty them onto the prepared baking pan and cover with aluminum foil. Roast the beets for about 1 hour or until they are fork tender. Allow to cool and then carefully peel of the skins off and cut into chunks (I actually roasted my beets the night before. So then the night I made the soup, I just had to peel the skin off and chop them). 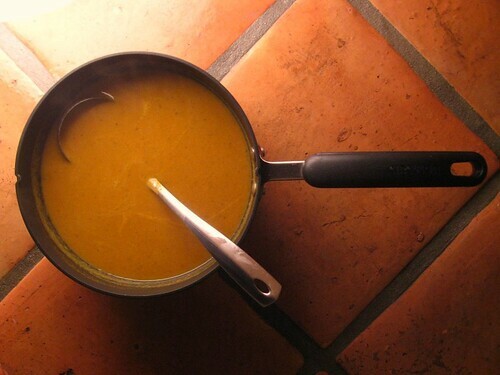 Heat the oil in a medium soup pot over medium heat. Add in the onions, carrots and the rest of the dried thyme and allow to soften for 8-10 minutes (until lightly browned) Add in the chopped garlic and cook for another 2-3 minutes, stirring occasionally. Add in the stock and the roasted beets, bring to a boil, then reduce to a simmer for 20 minutes to allow everything to really soften up (this will make pureeing so much easier). After the soup has cooked, carefully transfer it to a blender and puree in batches (I did this in two batches. You don’t want to overfill the blender when you’re blending hot liquids – filling it halfway full is a good rule of thumb. Steam needs to escape, and you don’t want to get burned wen your soup explodes out of the blender). An immersion blender could work here as well. Return soup to the pot over a low heat and stir in the vinegar and honey, check for seasonings and add salt and pepper if necessary. 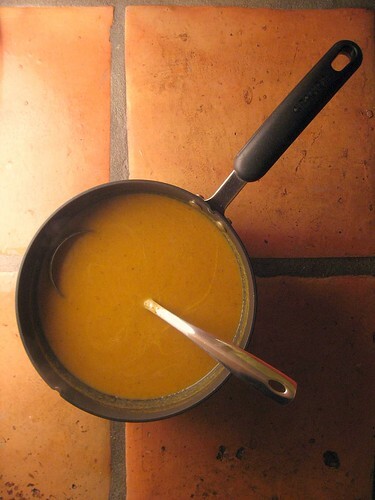 If the soup seems too thick, add more vegetable stock. Serve warm with a dollop of sour cream! Yum. I’m still in awe and pleasantly surprised. Why didn’t I make borscht sooner? This is absolutely wonderful! I am thrilled to have come upon your blog. I googled a ‘spaghetti squash bread’ recipe and loved the one from this site. I was talking with my husband the other day and we want to try new recipes…mature our palate. I had lived in Romania from 2005-2006 and I had tried borscht but never got a recipe for it. I am so excited to try this! Thank you! I enjoy your writtings. Keep it up! Thanks for your very kind comment! I don’t know if this is a super authentic borscht recipe (having never tried it myself until I made this), but it makes a pretty good soup, so I hope you enjoy it! Thanks for stopping by!